Kids camping safety tips are of great importance amongst all the precautionary measures that are taken by campers. Kids are so eager about camping yet thoughtless about the hazards. As children are so inexperienced and naïve, they are much more vulnerable to harmful accidents in the untamed backcountry than adults. Teach your kids all the camping precautionary survival and kids camping safety tips that you know. Take them on short camping trips near your house to get them accustomed to safety measures. Finally when you do take them on a to campout, check the weather forecast beforehand. Another safety measure would be to never let the kids out of your sight. If you are camping in an untried area, obtain the local crisis telephone numbers beforehand. Be familiar with the location of the nearest telephone or ranger station from your campground. Since children are extra sensitive to the cold and heat, dress children in several layers of clothing when venturing in the outdoors. This makes it easy to change their attire according to the current weather conditions. Here is one kids safety tip: if the inner clothing layer is synthetic, it helps absorb moisture from the skin. Don't build a fire if it's against park rules. For optimal fire safety, heed the fire danger levels that are posted at the park entry. Fire warnings may vary from day to day. Your campfire pit should be big. enough to easily contain the campfire. 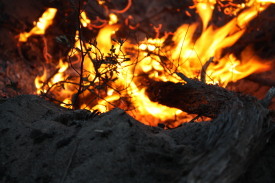 Avoid making campfires on windy days. A bucket of water and shovel near your campfire is a must. All matches and lighters should be kept out of children’s reach. Your kid should never light a match or lighter inside a camp tent. Never burn charcoal or light a heater, lantern, or camp stove in a camping tent or near a kids sleeping bag. An adult should always oversee children near campfires and stoves. Teach the kids camping safety tips and how to keep a safe distance from the heat and flames when campfire cooking. An adult should always accompany children on camping hikes. Map out your camp hiking trail well ahead of time and make sure you do not stray from your planned path. Learn how to operate a compass while hiking and camping. Drink plenty of water, and carry high-energy snacks for the kids on your camp hike. Wear clothing that covers exposed bare skin. Wear good hiking boots and always bring along rain gear. Use insect repellents to keep bugs at bay. Inform someone else about your camping and hiking plans and also your expected return time. First aid provisions should be your constant camping companion. Plants: Teach children about all potentially poisonous plants like poison ivy, poison oak, and wild berries. The best advice would be to stay clear of all unknown plants. Animals: Some kinds of snakes and spiders are potential hazards around children. The safest course is to just stay away from all snakes. Never tease or play with a wild snake. This is the reason for nearly all accidents regarding campers. Also keep away from heavy underbrush where snakes or spiders might reside. Harmful Gas: Carbon monoxide is a harmful gas that is sometimes unsuspectingly encountered on a camping trip. This kind of camp poisoning is deadly, as the gas is colorless and odorless and can arise from lanterns, vehicles and portable camping heaters. If it is enclosed in an unventilated area, it can be very harmful. Never light a heater inside your kid's tent. Apply a generous amount of sunscreen at least 15-30 min before heading out on an outdoor activity. Children should reapply sunscreen occasionally during the day even if it is cloudy. Children should be dressed in light colored clothes covering most of the body while camping outdoors. To avoid overheating or dehydration, your child should drink water frequently. Your child is more at risk to sun stroke when being active in warm-weather camping, so be watchful. Consult a doctor regarding the safety of insect repellents. Some repellants are too strong for young children. 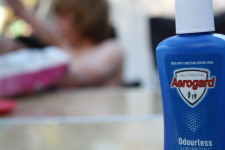 If you're sure about its safety, you can smear repellant sufficiently their exposed body and clothing when camping. Children should avoid aromatic things like perfumes and shampoos as the smells attract insects. Shake your children’s clothing before they wear it to remove any unwanted creatures. Your kids should never bother/provoke animals, especially snakes or bears and leave the site quietly and immediately. Do not leave your kid alone with a wild animal no matter how harmless it may seem. After spending time outdoors check your kids’ clothing and uncovered body for ticks. For a more relaxing camping trip keep to these kids camping safety tips. They are easy to follow and if you stick to the tips offered you can avoid many camping dangers during your camping activities. Just being aware of safety concerns can alleviate many potential risks. Follow the kids safety tips when you take kids tent camping, thus ensuring trouble-free camping for you and a fun time for your kids.